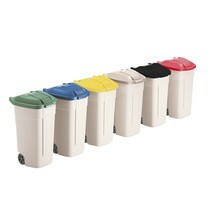 The Rubbermaid® compact and mobile recycling bin helps you to properly separate recyclable materials. Made of durable plastic, it is suitable for use indoors and outdoors. With this pedal waste bin, you can dispose of odorous waste in a quick and hygienic manner. 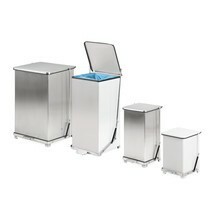 The user-friendly bin is ideal for canteen kitchens. The Industrial waste bin, with foot pedal guarantees optimal waste disposal. Thanks to its high-quality workmanship, it is able to reliably withstand the daily demands of everyday working life. The Durable waste paper bin is self-extinguishing and made of steel. In the event of a fire, it cuts off the oxygen supply from outside to smother the flames inside. The DURABIN waste and recycling container 60 litres with robust carry handles for easy transport is ideal for collecting waste. It also has clamping slits for bin bags. Manufactured from especially durable material, this Rubbermaid® universal container is the ideal choice for many requirements. The large comfortable handles make it simple to transport and easy to empty. The steel Push waste bin facilitates waste disposal with its large, self-closing flap. Thanks to its appealing exterior, you can put the bin in operational areas and in the office. The large-volume Euro-Pedal waste bin can be conveniently filled using both hands without having to touch the lid. Thanks to its high-quality workmanship, it can withstand the daily loads of the working environment. This Rubbermaid® square plastic universal container is characterised by a particularly durable material. Thanks to its large handles, the Rubbermaid® waste container is very easy to empty and simple to transport. The SLIM waste bin is easy to operate with its pedal if you do not have a free hand. 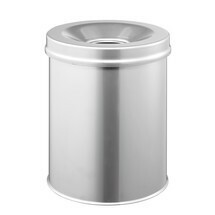 The container made of stainless steel is extremely sturdy, durable and elegant looking. This recycling collection container convinces with its extreme robustness and is suitable for many applications. In addition, you can supplement the square container with separately available attachments and transport frames as needed. The Rubbermaid® Profi pedal waste bin in plastic is robust and durable. It has a low-noise lid operated by a foot pedal. This makes it suitable for hands-free operation. 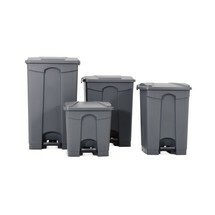 The Rubbermaid® Slim Jim® recycling container is an efficient size so does not require a great deal of floor space. 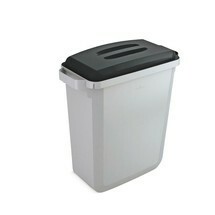 The recycling container is made from durable polyethylene and is therefore break-proof. The plastic lid for the Rubbermaid® Slim Jim® recycling container, 60 and 87 litres, with paper slot simplifies the recycling of paper and card. The opening in the lid allows paper and card to be disposed of while concealing the waste. 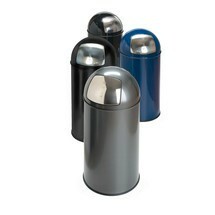 This VAR® recycling container in galvanised and powder-coated steel convinces with its robustness. Its self-extinguishing function makes the waste bin particularly suitable for highly flammable substances and cleaning materials. In addition to its disposal function, this self-extinguishing recycling container provides security against the spread of fire and smoke. The waste separation system possesses high stability and long-lasting benefits. 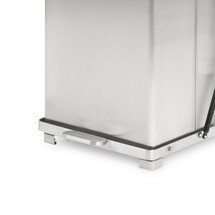 This pedal waste bin in stainless steel can be easily opened with its ergonomically shaped pedal. The lid closes softly and quietly, making it particularly suitable for use in environments where noise is to be avoided. This sturdy and durable recycling container can be used to separate your rubbish practically and securely. The compact double door is available in 8 different colours and is ideally suited for a clear operational sorting system.